Mrs. Valborg Davis of Plainwell, Michigan passed away Monday, December 3, 2012 in Plainwell. Mrs. Davis was born November 13, 1920 in Ryder, N.D. to Schjold and Ellen (Troite) Eide and had been a lifelong resident of North Dakota until moving to Michigan in 2000. Valborg had worked for Drake High School for over 5 years, was a secretary for many years at the local doctor’s office and had run the Tioga Hotel with her husband Edward . She was an avid baseball fan following the Twins, Braves and most recently the Tigers. 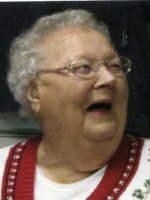 Valborg enjoyed playing cards, fishing and embroidery, was active in the Otsego Moose Lodge and was known for her wonderful homemade bread. She loved her family and was very proud of all of them. Surviving are 5 children, Sandra Beach of Delton, Lois Reinhardt (Wayne Volk)of Bismarck, ND, Lila (Jack) McDermid of Biwabik, MN, Gordon (Jodi) Davis of New Salem, ND and Dorothy (Jerry) Bissonette of Richand; daughter-in-law, Carol Davis;12 grandchildren; many great and great-great grandchildren; her siblings, Lou Eide of ND, Sonja and Pearl of WA and many nieces and nephews. Preceding her in death were her husband Edward; her daughter Karen Piper and son Sterling Davis; granddaughter Rhonda Piper; siblings, Donald, Orlean, Vernon, Janice and Royce; sons-in-law, John Beach and Gilmore Reinhardt. The family would like to thank the staff at Life Care Center Plainwell for all the care and support for Valborg. Cremation has taken place. A Memorial visitation will be held from 6 to 8 P.M. Thursday at the Winkel Funeral Home, Otsego. Burial of ashes will take place in Ryder Cemetery, Ryder, ND. Contributions in memory of Valborg may be made to Life Care Center of Plainwell.